The United States is examining a variety of potential legal justifications for any type of military action. While three United Nations Security Council resolutions have failed to pass because of Russian veto power, officials say some in the administration believe it may be worth it to make the effort. But with Moscow already promising to declare any military intervention illegal, the United States and its allies would likely have to act without a U.N. mandate. Officials have pointed to the 1999 conflict in Kosovo as a precedent, where President Bill Clinton used NATO backing and the "responsibility to protect" (R2P) as a legal basis for airstrikes without a U.N. mandate. Adopted by the United Nations, including Russia, as an international norm in 2005, the R2P seeks to justify outside intervention in a country's internal affairs, if that state had failed to protect its population from atrocities. Given that the use of chemical weapons is considered a crime against humanity and banned by the 1993 Chemical Weapons Convention, the R2P could be applied to Syria, although its legitimacy in the absence of a U.N. mandate is debatable. President Barack Obama, a former law professor, noted the legal landmines when he told CNN's Chris Cuomo on Friday, "if the U.S. goes in and attacks another country without a U.N. mandate and without clear evidence that can be presented, then there are questions in terms of whether international law supports it; do we have the coalition to make it work?" 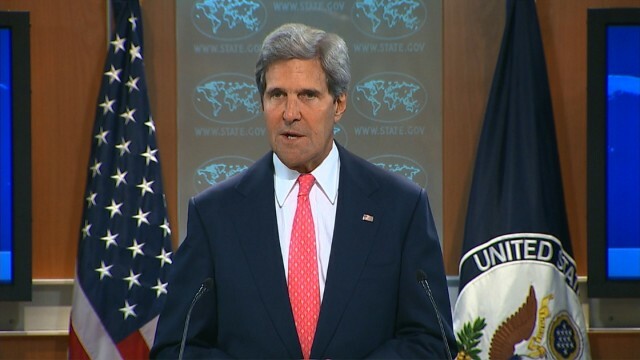 Kerry noted he and President Obama have been spending the past few days reaching out to foreign leaders and ministers. U.S officials and diplomats say those calls are part of an effort to rally major European and Arab allies to form the basis of what could be a coalition for action against Syria. Those countries include Britain, France, Canada, Germany, Qatar, Turkey, Saudi and UAE. Washington does need to consult with allies to ensure they are supportive of any U.S. action. But the Obama administration has been pretty clear that any potential action would be limited in scope and one official suggested the United States may not need a formal "coalition" to help execute a limited military response. Marie Harf, a deputy State Department spokesman, cautioned against conflating any potential action with a broader policy change, calling any U.S. response "a determination on how to respond to a blatant use of chemical weapons, and it's not necessarily to change the entire situation on the ground in Syria." Officials expanded on the goals of any action: punish Assad for the use of chemical weapons, show him there is a cost to using them and prevent him from using such weapons again. Even though Obama has said Assad should leave power, any U.S. action would pointedly not be to realize that stated U.S. policy objective. Officials say the United States would like to degrade the regime's capabilities enough to weaken him against the Syrian rebels but not cause the regime to completely fall. The United States still hopes to achieve a political solution to the crisis and has struggled to find a viable Syrian political opposition group to work with. The United States fears if the Syrian regime fell today, the opposition would not be ready to assume power, and Islamists, growing in power and influence in Syria, would move to fill the void. You got that right, John. Thank you. Kerry your mother is a Irish potato farmer from Dublin I think USA cant do anything today its technology is inferior its paying Russia to get its astronauts into space. Other then Kerry flapping his lips about what he thinks and not facts has any info come out about who used the gas?